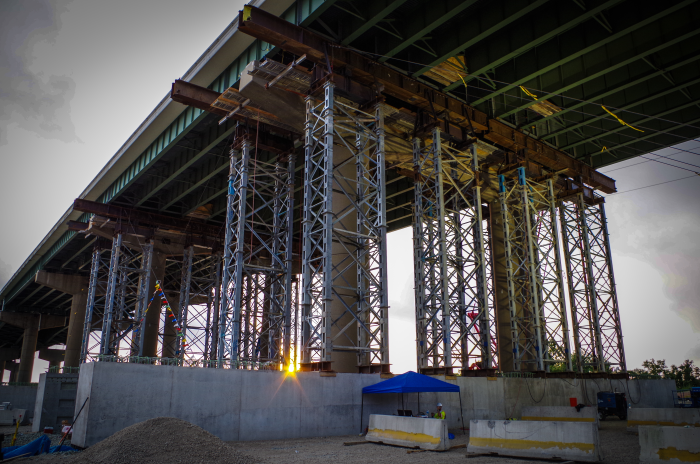 The Delaware Department of Transportation (DelDOT) notified Intelligent Infrastructure Systems (IIS) and Pennoni of the need for an emergency, hands-on inspection of the superstructure and substructure of Spans 11 through 14 and Pier 15 of Bridge 1-813. The bridge, located in Wilmington, Delaware, is composed of twin structures carrying northbound and southbound Interstate 495 traffic. It features independent multi-beam superstructures and independently supported hammerhead piers under each half of the structure and carries 90,000 vehicles per day. Within 40 minutes of being alerted to the problem by DelDOT, IIS engineers were on site to assess the condition of the bridge. Transverse rotations up to 4 percent from their original position were observed in Piers 11 through 14, causing the median barriers to be vertically out of alignment by as much as 17 inches, which was visible from the roadway. It was later determined that this rotation was a result of a large earth embankment (estimated at 50,000 tons) placed immediately adjacent to the structure, causing compression of the underlying soft soils and lateral pressure on the bridge foundations. The bearings, field splices, cross-frame connections, deck joints, top of deck, hammerhead pier caps, and pier columns were all inspected hands-on to assess any damage caused by the global rotations and movement of the structure. Measurements were collected to document these rotations and other movements. In addition, open pits were excavated along the south faces of the foundations of Piers 11 through 14, exposing the full height of the footing and approximately 18 inches of the piles beneath the footing for inspection. The bridge was reopened to traffic within two months. During construction of the temporary repairs, strain gages were installed on the temporary post tensioning bars to monitor the change in strain in these elements as the structure was lifted and rotated back into alignment. During the lifting and realignment process dynamic data was required, so the system was reconfigured using Campbell Scientific CDM-VW305 modules that were used to collect data from the tiltmeters and strain gages at a 20-hertz sampling rate. Following completion of the permanent repairs, IIS installed a long-term monitoring system consisting of 48 tiltmeters. Five remote Campbell Scientific AVW206-AM16/32B data-acquisition units read and provide power to the tiltmeters. The remote units are powered by a Campbell Scientific SP10/BP12 solar panel and battery combination. Every 15 minutes, an RF401 spread-spectrum radio transmits data to a CR3000 base station, and then two Sierra Wireless cellular modems transmit the data to DelDOT and IIS.